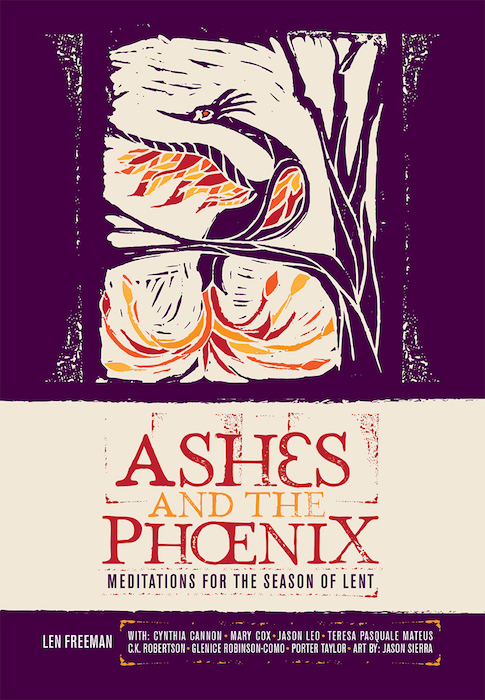 Every Monday evening throughout Lent we gather to discuss a passage from Ashes and the Phoenix: Meditations for the Season of Lent. These 45-minute gatherings start at 5 p.m. and are open to everyone. Feel free to join us for one Lenten Reflection Circle or all of them! You can pick up your free copy of Ashes and the Phoenix anytime between 10 a.m. and 4 p.m., Monday through Thursday. From 7:30 a.m. to 5:30 p.m. on March 6, Father Peter distributed ashes and blessings in the Furness Burial Cloister. Check out the photos from this year’s Ash Wednesday. See below to find out why Ash Wednesday was especially significant for us this year. 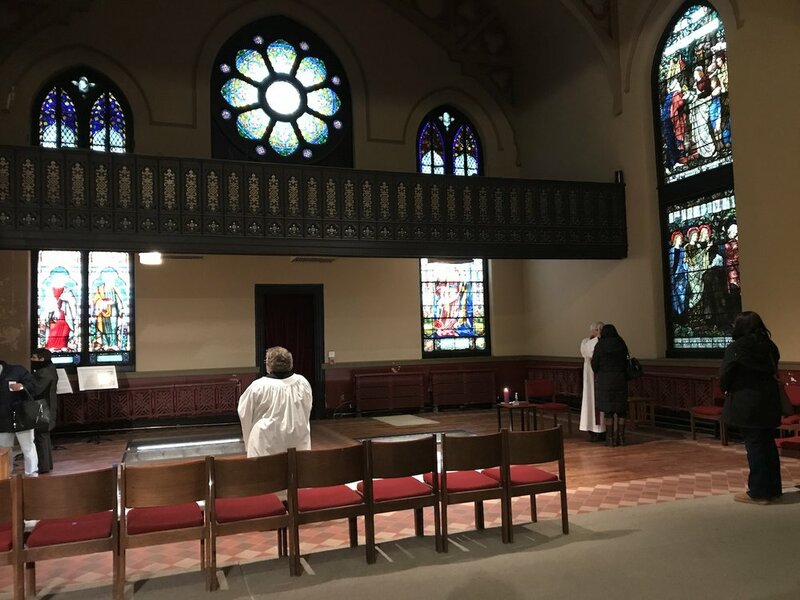 Over the last 18 months, we at Saint Stephen's have created the Furness Burial Cloister from Furness’ 1878 transept: We remodeled its floor to reveal part of the church’s original cemetery built soon after the church was founded in 1823. Furness’ addition now movingly frames the inscribed burial vaults of 9 parishioners from the church’s first decades (1825-1875). For this Ash Wednesday on March 6, we will distribute ashes and offer Lenten prayers here rather than in the sanctuary as we have done in years past. Saint Stephen's historian and curator, Suzanne Glover Lindsay, explains below why Ash Wednesday in this new and unusual site has special meaning for the church beginning this year. Ash Wednesday, in general, is a time set aside for us to remember who we are, what we have come from, and where we are headed. My hope is that being present in the silence and sacredness of this place, with those of long ago, will help us to begin Lent with living memories that can sustain us in our preparation for Easter, that climactic celebration of Christ’s resurrection. The crowning glory of the floor, the architectural glass for the five sunken vaults revealed in the floor, is in! And it adds unimagined dimensions. It draws your eye from afar with its subtle shimmer, like a lake responding to a light breeze. Then it reflects our stained-glass windows when they align with the glassed vaults as you walk around. Up close, the glass disappears to reveal the vault below the floor, lit with LED for both legibility and drama. 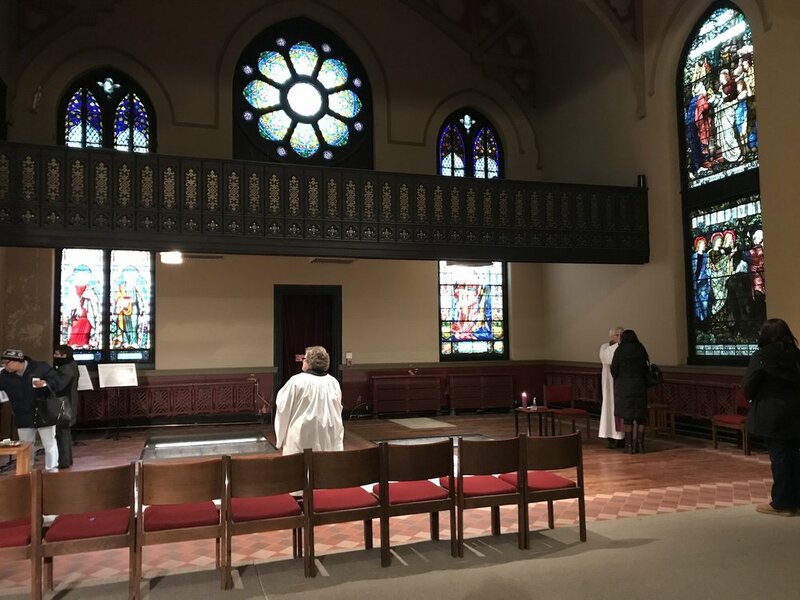 Though we await the finishing touches, like repainting damaged walls, we consider the offering of ashes and Lenten blessings on Ash Wednesday in the Furness Burial Cloister the ritual opening of the remodeled space. The event is rich with meaning. St. Stephen’s returned to active religious life on this Fast Day two years ago, ritually marking the church’s resurrection after a year of suspended activity. Furness’ 1878 transept, transformed into a unique burial site, lends another layer. Drawing the buried dead into the church among us, after a century of being covered and largely forgotten, gives palpable witness to the church’s resurrection as a community that lives closely with its past. The Furness Burial Cloister is now a quietly eloquent, powerful place, dedicated to life and community across time and the mortal threshold, within a church that grows more vital daily. Come celebrate with us.